This group is for the outdoor enthusiast. Whatever gets you outside is the topic. Discuss gear, trips, cool things you have seen or done. New ideas, or ask questions. If you are knowledgeable about something share it by posting a discussion about it. Location: One step out your door. You need to be a member of Outdoor Living Hosted by Robert Burris to add comments! 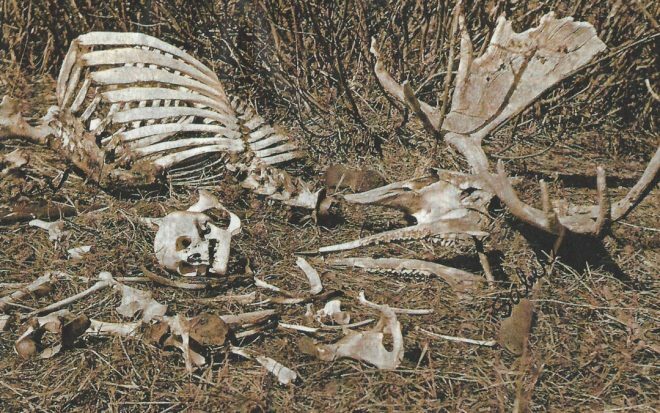 In a thicket about three miles north, Mr. McKelvey ran across the skeleton of a moose, and upon closer investigation, found parts of a human skeleton, which clearly showed that some hunter years ago had shot and wounded a moose and then been killed by the animal. Close by was found a Springfield 45-70 rifle with the breech open, and a shell which had stuck told how the hunter had lost his life. He had evidently fought to a finish for a broken knife (that) was found on the ground. Old-timers in the vicinity of the park are of the opinion the skeleton is that of a French-Canadian trapper who disappeared about 18 years ago, but none remember his name. There is no doubt that the man lost his life a long time ago, for the bones are bleached and the rubber shoes which the hunter was wearing are badly weather-worn. Mr. McKelvey got an excellent photograph of this tragedy of the hills. It shows the two skeletons where the combatants fell after their fight, together with the rifle and other equipment of the hunter. Whatever you choose to believe about the cause of death of these two creatures, it’s certainly worthwhile to remember that wild animals can be dangerous — and hunters sometimes come out on the losing end. THE LEONID METEOR SHOWER: Earth is entering a stream of debris from Comet 55P/Tempel-Tuttle, source of the annual Leonid meteor shower. NASA cameras have already detected a number of Leonid fireballs over the USA with peak rates expected on Nov. 17th and 18th. The weekend display is best seen at dawn alongside a new comet and a conjunction between Venus and the brightest star of Virgo. Visit Spaceweather.com for the full story. I like seeing rainbows. It always reminds me of God's promise. Are you in the cone of uncertainty for Irma? Dont wait until too late. Is your bugout bag ready? Important papers? Start running your ice makers now and bagging the ice in freezer bags. Fill as much space in between your freezer items as you can. We are seeing a good number of these happening, what about in your area? So according to this we are looking for a cold and wet winter with possible white. We are right at the tip of GA/NC border. As of today, I would have to say it is going to be an early Fall. Although Autumn officially begins Sept 22, we have been checking the wood pile and generally looking around the house to see what chores need to get done before winter comes along. The doors and windows have been open for a good 2 weeks now, the weather if ranging high 70/low80's during the day and mid 60/high 50's at night. The webworms have started in earnest and we are seeing some color change with leaf fall. NONE of this should be happening, but there you go. Time to prepare the homestead. Sooo, is the weather whacky at your place this summer? Are you noticing anything out of the ordinary? We are doing all the right things up here. We have all taken down the bird feeders, we have made sure anything thrown away with food smells is in ziplocks in the trash. We are keeping outside lights on at night and we have all walked our properties for the underground yellow jacket nests and gassed them. What we are afraid of this weekend is that visitors to our area are throwing out trash. We have found 2 trails of fast food wrappers and containers and picked them all up. We were rather hoping with all the camping going on this weekend for the eclipse that he would move on for better hunting grounds. The 35 Remington is loaded now, the revolver changed it's cylinder from snake shot to 22 mags.